Introducing New, Improved DST Series Digital Force Gauges | Imada Inc. The DST Series Digital Force Gauges are basic digital force gauges that feature large backlit LCD displays and simplified menu operation for ease in testing across a wide range of compression and tension applications. DST Series displays can be configured in basic format to show value, unit of measurement and measuring mode, or in multi-line format to display peak and real time values simultaneously. Gauges have an ultra-high 30,000/second sampling rate to accurately capture peak destructive force values. Collect data via USB or RS-232 connections with the optional Force Logger or SW-1X software. Additional features include reversible display for normal and inverted measurement readings, as well as high/low setpoints with OK indicator for Go/No Go testing. The backlight can be turned off to conserve power. These gauges are ergonomic and durable, with a heavy-duty metal construction, security setting lock to prevent accidental changes and push-button tare function. DST Series Gauges run on internal Ni-MH batteries (user replaceable), AC power (via adapter) or USB chargers. DST Series Digital Force Gauges are available in ranges from 0.4 lbf to 220 lbf and come with all the new features at the same price point as previous DS2 Series Gauges. DST kit includes set of six attachments, AC charger/adapter, calibration cert traceable to NIST and carrying case. 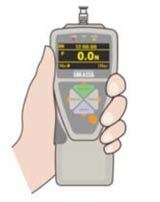 For more information about DST Series Digital Force Gauges or to view models and ranges, please visit https://imada.com/products/dst-digital-force-gauge/.